Moving onto the next instalment of this series on Alex Campbell, the previous article had reproduced a "confession" letter which could not be taken seriously. However, the next accusation needs a bit more attention as it concerns an allegation of outright lying by Campbell. But first, let me give the background on this particular story. One day early last month, at about half-past nine in the morning, I was watching this end of the Loch. The light was very uncertain, there being a fairly thick haze on the water, and along with this the sun was shining directly in my eye through the mist, making the visibility very bad. I had not been watching for more than a minute before I noticed a strange object on the surface about six hundred yards from where I stood. It seemed to be about 30 feet long, and what I took to be the head was fully 5 feet above the surface of the Loch. The creature, if such it was, and at the time I felt certain of it, seemed to be watching two drifters passing out of the Canal and into Loch Ness; and, whether it was due to imagination or not, I could have sworn that it kept turning its head and also its body very quickly, in much the same way as a cormorant does on rising to the surface. I saw this for fully a minute, then the object vanished as if it had sunk out of sight. . . . I ran back to where my boat was anchored; but by the time I got back to where I could see the object—if it had re-appeared—there was no sign of it.' . . .
Last Friday I was watching the Loch at the same place and about the same time of day. The weather was almost identical—practically calm and the sun shining through a hazy kind of mist. In a short time something very like what I have described came into my line of vision and at roughly the same distance from where I stood. But the light was improving all the time, and in a matter of seconds I discovered that what I took to be the Monster was nothing more than a few cormorants, and what seemed to be the head was a cormorant standing in the water and flapping its wings, as they often do. The other cormorants, which were strung out in a line behind the leading bird, looked in the poor light and at first glance just like the body or humps of the Monster, as it has been described by various witnesses. But the most important thing was, that owing to the uncertain light the bodies of the birds were magnified out of all proportion to their proper size. This mirage-like effect I have often seen on Loch Ness, although not exactly in the same form as I have just described. Other people, who know the Loch, can verify my statement as to the mirage,' but it only occurs under certain conditions and if the Loch is calm. Then it gives every object—from, say, a gull or a bottle to an empty barrel—a very grotesque appearance provided that such objects are far enough away from the observer. . . . So, the letter seems rather matter of fact as Campbell explains to Gould how one can be fooled by a combination of mist and birds into thinking there is a monster before you. However, the stakes are raised in this story as Alex Campbell appears to go back on this letter and tout the event as one of his best sightings of the monster. 22nd September 1933. A. C. Observer was on a point of land between the Canal and the River Oich at Fort Augustus. About 9.30 a.m. saw the animal towards centre of loch in Borlum Bay, distance 500-600 yards—dead calm—estimated length to be 30 feet. Head and neck about 5 feet long, neck 1 foot thick and head size of cow's but flatter, head about 2 feet above water. Skin dark grey —black and rough looking. Seen for several minutes. Noted front paddles working, on either side alternately, as it turned about. Points which chiefly struck the observer were: (1) great size and bulk, back about 18 inches above water, (2) alertness, it turned its head and neck about as quick as a hen, appeared to listen and to try to locate the sound made by two drifters steaming down the Canal, (3) instantaneous way it sank—not dived—as the front drifter showed beyond the point of land. I enclose a sketch of what I saw away back in 1934 (my first view of the Monster), and the description of the incident is as follows: I was standing at the mouth of the river Oich (which flows past my door) one beautiful morning that summer —May, if I remember aright, and was gazing across the loch in the direction of Borlum Bay. Suddenly my attention was drawn to a strange object that seemed to shoot out of the calm waters almost opposite the Abbey boathouse. As you can see from the sketch, the swan like neck reached six feet or so above the water at its highest point, and the body, a darkish grey glistening with moisture was at least 30 ft. long. I gauged this carefully in my mind's eye by placing two ordinary rowing boats of 15 ft. overall length end to end, and I don't think I was far wrong, because I have had lots of experience of that sort of thing, because I have lived on the shores of the loch all my life—apart from the last war years. Still watching and wondering if I would have time to run for my camera, I heard the noise of the engines of two herring drifters (they call them trawlers in England) which were proceeding down the lower basin of the Caledonian Canal, which enters the loch almost alongside the Abbey boathouse. The animal certainly must have heard, or sensed, the approach of these vessels too, for I saw it turn its head in an apprehensive way, this way and that, and, apparently being timid, it then sank rapidly out of sight, lowering the neck in doing so, and leaving a considerable disturbance on the mirror-like surface of the loch. The animal would have been some 400 yards from where I stood, possibly less, and I had a very clear view of it which lasted several minutes. So here we have a situation where Campbell tells us his years of lochside experience helped confirm it was a monster, yet his 1933 letter says the opposite. The book helpfully supplied this artistic rendition of the monster, based on the sketch supplied by Campbell. You may be wondering at this point what the other monster sketch at the top of page refers to, but we will get to that further on. So, the accusation runs as follows. Alex Campbell wrote concerning birds in the mist which almost fooled him into thinking he had seen the monster. Later he decided to turn it into a monster sighting and began to tout it as genuine. Therefore he lied, therefore he is not to be trusted as a source of Loch Ness Monster information. End of story? Move on? No. Now when I decided to look again as this story, I realised it was a bit like an archaeologist who digs up some incomplete shards of pottery and has to reconstruct the shape of the jar. The problem is we do not have a direct confession or denial from Alex Campbell on this volte face and so it is down to forensics and drawing out conclusions based on indirect "evidence" from newspaper clippings and books. The opponents of Alex Campbell have certainly taken this reconstruction approach (especially Ronald Binns who we shall address in the next article) and so I think I will do the same. But, you know, it is rather a pity that all these sceptics who were at the loch at the same time as Alex Campbell never seemed to bother to ask the man about this conundrum. Certainly there is no written record anywhere I can see. Perhaps they had already pre-judged him and decided that any answer he gave would be worthless? Imagine a court of law proceeding in that way. I call this botched and incomplete research. I could call it a few other things, but back to the story at hand. Looking back at the letter that Gould reprinted, a few questions arose that the sceptics did not seem to address. The first question is why the letter was addressed to the Ness Fishery Board rather than Gould? Secondly, why was this so called self-publicist and monster-pusher suddenly turning witness for the prosecution and playing the sceptic? Thirdly, why was a man who had thirteen years experience as a water-bailiff around Loch Ness coming across as so easily duped? In fact, another question raised from this is which of the two accounts is false? The monster one or the cormorants one? If you asked certain sceptics this, they may look at you as if you just emerged from a cave and say "the monster one - obviously!". Well, if you think there is no monster in Loch Ness, I guess that is the only course to take. 7th September 1933 - Date of Campbell's sighting. 27th September - Dundee Courier - Appeals made to Scottish Fishery Board to investigate the monster. 17th October - The Scotsman - Campbell's anonymous monster account is published. 20th October - Dundee Evening Telegraph - Scottish Fishery Board may investigate - Ness District Fishery Board to meet soon. 24th October - Dundee Courier - Statement from Scottish Fishery Board. 24th October - Edinburgh Evening News - Text of Scottish Fishery Board statement. 28th October - Campbell writes sceptical letter to the Ness Fishery Board. 15th November - Scotsman - Campbell's anonymous monster account retold. 17th November - No action taken by Ness District Fishery - no evidence of harm to fish stocks. Some things need to be clarified here. There was the Scottish Fishery Board based in Edinburgh which oversaw matters relating to sea, river and loch fish stocks. The Ness District Fishery Board was the sub-department which oversaw the region around Loch Ness with the emphasis on salmon. Mention of the working of the legs also comes into a description which, to anyone who is at all sceptical, must appear to be very fantastic. It was given recently by a man who up to that time had refused to believe of the existence in the loch of anything other than a seal or a large marine animal of some kind. He stated that one afternoon a short time ago he saw a creature raise its head and body from the loch, pause, moving its head—a small head on a long neck—rapidly from side to side, apparently listening to the sound of two drifters coming from the Caledonian Canal, which was out of its sight, then take fright and sink into the water. While it was above water, he said, he could see the swirl made by each movement of its limbs, and the creature seemed to him to be fully 30 feet in length. The description he gave of its form was like that of a plesiosaurus, and when shown a sketch of a "reconstructed" plesiosaurus, he stated that it was very like the animal he had seen. That needs to be pointed out since if one reads the Gould account on its own, one may assume Campbell had not reported anything to the media. The story was rerun in the November 15th edition of the Scotsman in which the sketch at the top of this article was printed (as an aside these Scotsman articles were important in raising the profile of the monster to a wider audience and led to Fleet Street picking up the story too). Well, the earliest version was actually our Scotsman newspaper eleven days before Campbell's letter. So it is logically the most accurate - this sceptic should have known that since it was footnoted below the text of the letter he copied! With sceptics, it is often what they do not say that is important, rather than what they do say. Be careful out there, folks. The official was frankly sceptical of the existence of a “monster” and suggested that it might be a whale or grey seal which had reached distorted size through the powers of imagination. Four days after this sceptical, no-nonsense pronouncement from the Fishery Board, Campbell sent his sceptical, no-nonsense letter to their Ness District branch. Nessie sceptic, Ronald Binns, dismissively says that Campbell wrote to the Board for "some obscure reason". If he had temporarily suspended his zeal to nail Campbell, it would be obvious to him why Campbell wrote this letter - he was afraid of losing his job! Here is the scenario. Campbell sees the monster on the 7th September. He openly tells people such as Cyril Dieckhoff about it. However, by mid-October it becomes apparent that his employers are taking a dim view of the whole thing but he still tells the Scotsman reporters about it, but under condition of anonymity (the only witness to ask this of the newspaper). Meantime, he goes back to Dieckhoff and tells him in no uncertain terms to keep his name off the record. However, unlike his letter to the Fishery Board, he does not tell Dieckhoff it was a misidentification, but rather diminishes it. But it is clear to Dieckhoff that something is wrong here as indicated by the word "anxious". The heat is on when the Scottish Fishery Board openly derides the whole affair and Campbell now fears he may be found out and not deemed a fit and proper water bailiff if he continues to see and promote imaginary monsters in the waters he is meant to police. Let me give you some context here. It was the back end of the Great Depression, the greatest economic downturn since the Industrial Revolution. If Campbell lost his job over this, he could struggle to find employment and the Welfare State was, shall we say, minimal. He was aged about 32 and may have been married with kids. A man may love promoting the Loch Ness Monster, but the day job is always going to be more important. In that light, he wrote that letter to present himself as the water bailiff the Fishery Board wanted to see and it may well have saved his job. Did he lie? Yes, he did; but not about monsters. He fabricated a misidentification report to annul the monster report that the Fishery Board may well have gotten wind of. If we had been in that precarious position, would we have done the same thing? We still see a trickle of monster reports being sent to the Inverness Courier through November and December, but under the same anonymous conditions as his own monster report to the Scotsman. Did he try and bow out of those? Who knows? Perhaps the increasing fame of the monster led to the Courier making him an offer he couldn't refuse and guaranteed his anonymity. But Alex Campbell finally recanted his sceptical version and began to wax bold about his original 1933 account, even giving up anonymity. When this began is not clear. I note that the Scotsman for the 15th November still carried his monster account (though still anonymous). Did Campbell miss this reprint or allow it? Certainly, he was allowing the monster version to be retold in Whyte's 1957 book, but that is a gap of 24 years. Did he just drift back into it over the years or did he snap back into it soon after 1933? By December of 1933, a radio review of the year mentioned in Gareth William's "A Monstrous Commotion" (p.285) has him declaring that he gave the monster its name (though Campbell is not named). But this may have been recorded back in early October before he got cold feet and again was used without his permission. Whenever he finally went back to his monster version, was he not still concerned about his job? What could have changed this? I suggest things may have begun to change with an event on the 30th December 1933. It was on that date that a Mr. Goodbody had a 40 minute view of a 16 foot multi-humped creature through binoculars. Coming away from that experience with the conviction that he had seen a strange, unknown animal had gained Campbell a friend in high places because Goodbody was no less than a former chairman of the Ness District Fishery Board and a current board member. Campbell could rest easier now that at least one of his overseers was sympathetic to the monster cause. How many more of the board members would join that merry band through a sighting themselves or knowing a trusted friend who did is a matter of speculation. According to the Inverness Courier of 19th January 1934, there was to be no further investigation of the situation by the Ness District Fishery Board. Mr. Goodbody attended that meeting and the agreement was that since there was no perceptible disruption to salmon stocks, the Board had no legitimate jurisdiction in the matter and washed their hands of it. Alex Campbell was free to continue his pursuit of the Loch Ness Monster. But I have found no further reference to his encounter between 1934 and 1957 and the reason for that may be the consequence of his job-saving lies. Quite simply, if he came out in public declaring loudly that he had indeed seen the Loch Ness Monster on the 7th September 1933, then he was guilty of lying to his employees because of his mist-wrapped cormorant letter. In other words, he could face the sack again for deceiving the Scottish Fishery Board. Let's face it, Alex Campbell was best just sitting on this story for a long time until all who had seen his letter had moved on to other things. That time appears to have been sometime in the 1950s. While we are on the subject of Campbell's 1933 sighting, I ought to address his other claimed sightings since these are also used as ammunition against him by the sceptics. Various sources tell us that Alex Campbell claimed up to 17 or more sightings of the Loch Ness Monster. I don't doubt that claim since I believe he has been recorded saying it himself. There are only three other people I am aware of claiming such a run of accounts and that is Winifred Cary, Alex Ross and Frank Searle. Now the rather flawed logic runs likes this. Frank Searle claimed a large number of sightings, but he was proven to be a liar and a hoaxer. Alex Campbell claims a similar number of sightings, therefore he is a liar too. Another piece of exemplary logic there from the Campbell bashers. Now if you ask these people how many times a person is allowed to see the monster before being labelled a liar, you won't get a answer that could be defended. But since they don't countenance anyone seeing a monster even once, I don't know what they are on about. Now looking at the sightings I have on record, I see at most six accounts. Certainly, I do not see anywhere near the 17, 18 or 19 claimed. Where are the rest, you may wonder? One suspects they were not worth reporting and further study bears this out. After all, Alex Campbell had described the sighting which occupied this article as his best sighting. In that case, the rest may not have been particularly "Grade A". Indeed, though I have demonstrated the problems with sceptical views of this account, that does not mean it becomes the greatest ever Nessie sighting. Looking at the various renditions of the sighting, it is generally stated that the creature was 400 yards away in Borlum Bay. At such a distance, I would class the sighting as good, but not in the top tier with the likes of John McLean and so on. If this was the best, then the other sightings were presumably inferior in terms of distance, time, amount of creature exposed and viewing conditions. In fact, a lot of them may have just been wakes or a long way off. In that light, I suggest the quality rather than the quantity of the sightings should be of prime consideration. Since it seems we may now never know the contents of those sightings, the matter must rest there. Thus ends my own particular reconstruction based on the shards of "pottery" available. Whatever way you look at it, Alex Campbell was guilty of lying. Either he lied about seeing monsters or he lied about seeing cormorants on a misty morning. The first, they say, was to promote a monster. The other, more importantly, to keep his job. Author Ronald Binns, swerves round the issue of the strange letter to the Fishery Board. Gareth Williams gets closer with his speculation about tensions between the two parties. Here was the nub of the matter - job or monster? To me, it is clear enough. In the next article, I critically examine Binns' allegations about Alex Campbell. 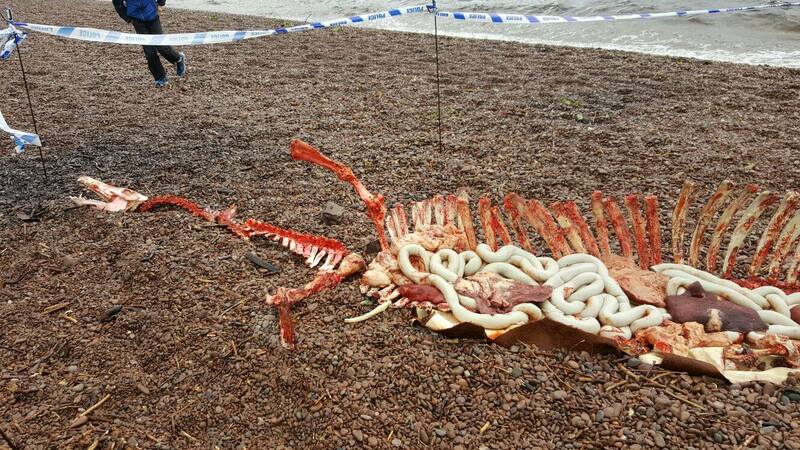 I may be wrong, but I think the new six part ITV murder drama, "Loch Ness" will air its first episode on Sunday, 30th April. The brief blurb for the show is as follows. I doubt the old girl herself will put in an appearance but it wouldn't surprise me if there is a scene where something perplexing is seen on the loch, but an "expert" pops out of the bushes to calmly reassure them it is only a group of distressed ducks being chased by a hungry seal. 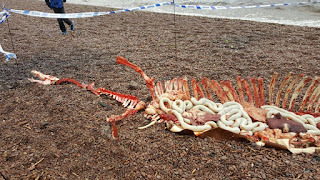 Readers may recall the show's publicity stunt with butcher's offal and suitably arranged bones last summer. Anyway, I look forward to watching this show. I don't know if the show will be available outside the UK. UPDATE: The series begins on 11th June at 9pm on STV. If you are in the Boston area between the dates of March 24th to April 29th, you may want to consider visiting the Barrington Center for the Arts who are hosting an exhibition by Nessie man, Bradford Johnson. The title of the exhibition is "1933—Year of the Monster: Painted dispatches of wonder, chicanery, and optics on the shores of Loch Ness".